To say I spent a large amount of time planning Henry’s party is an understatement. I’m the type of person who gets their mind set on something and will do whatever it takes to make that happen. For Henry’s party I may have taken that to a whole new level! First, I’d like to blame Pinterest. Before Pinterest, I had zero desire to throw an over the over the top party. Nor did I care about making decorations. Isn’t that what Party City is for? Second, once I discovered how much cheaper and fun, yes I said fun, making my own stuff was, there was NO stopping. As I mentioned before, I have to thank Carol for every ounce of my almost creative awesomeness shining through. While I knew what I wanted to do, thank you Pinterest, I had no idea how to make it happen. I have no problem paying other people to do things for me. It’s why I used to let my mother clean my house and beg my husband for a lawn service each Spring. Anyway, Carol is beyond a creative genius and knew just how to make all my ideas happen. I spent an entire Saturday at her house crafting. At one point Ben called and asked if I were ever coming home! All my supplies were purchased at Joann Fabrics and Carol helped by allowing the use of her cricut. These things are amazing! Everyone needs to invest in one or befriend someone with one. I must preface, working across the street from a Joann’s when you’ve finally decided that being crafty is fun, is super dangerous. On one big trip, the cashier asked what I was purchasing, so I explained. She then proceeded to dig through the trash to get me as many coupons as she could. Ended up saving me close to $40! I about cried at hugged her. 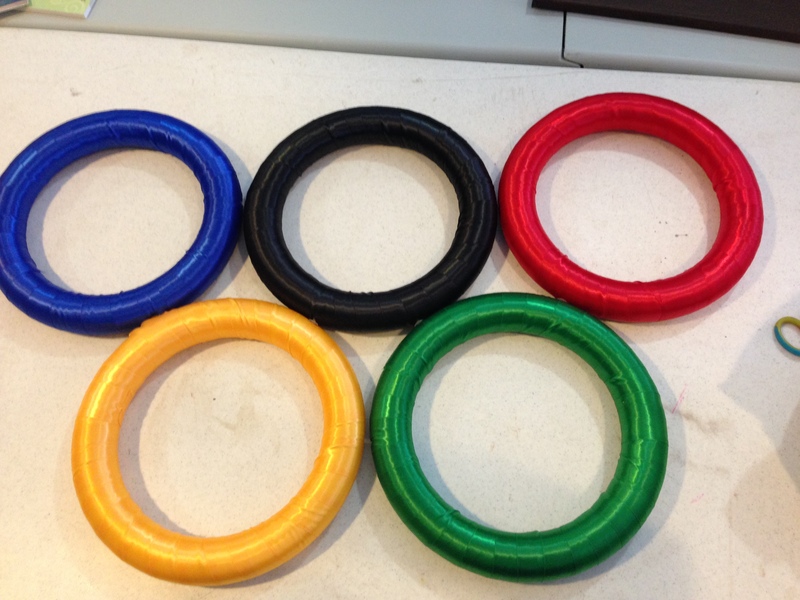 These rings, are my proudest creation. Made out of styrofoam wreaths and ribbon, I was beyond pleased with how they turned out. Satin ribbon worked best and not the kind with a wire. The wired ribbon would not wrap as nicely. I held them together with these styrofoam clips, but I’m not longer happy with that choice. During transport after the party, one of the rings broke, so when I fix them I’ll adhere differently. For the three banners, I used cardstock in primary colors. The Cricut (Carol operated and helped with the sayings) cut out all the letters. Her and her daughter, taught me how to cut the flags and circles. I used a fancy sticky roller thing to build everything and hold it together. 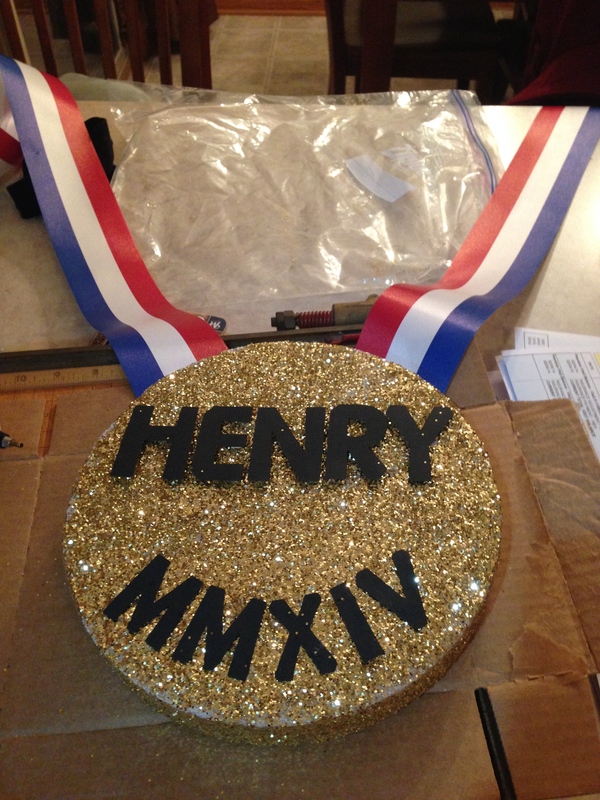 Carol also had the great idea of creating Henry his own gold medal. This was simple to create. A styrofoam disc, glitter, Mod Podge and ribbon. Again, Carol cutout all the letters for it. If you’ve never used Mod Podge before, it’s amazing. The stuff is sticky magic in a bottle. The creator of my invites, made the Rolo thank you favor tags. 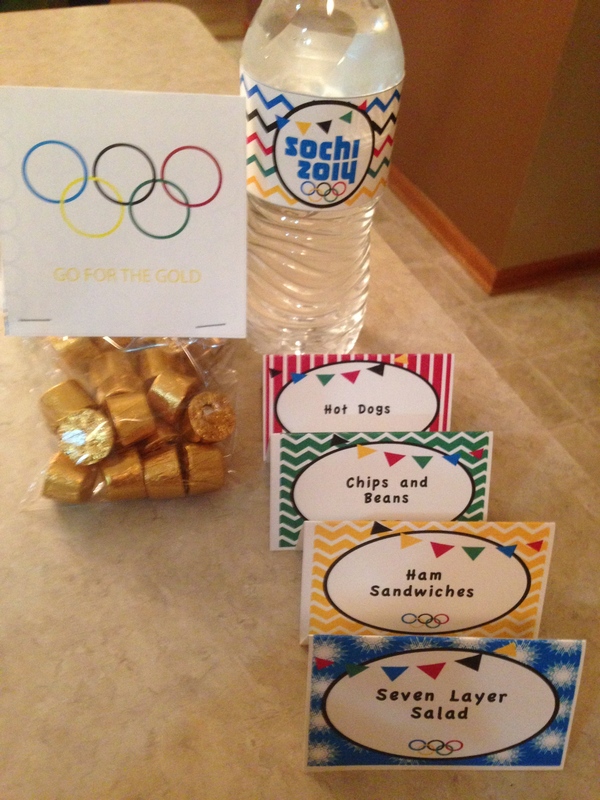 Good ole Google Searching landed me upon the awesome FREE downloads for the water bottle wraps and uneditable (nothing a little document processing can’t fix) Sochi printables. This is the point where the party reached a whole new level of ridiculousness. Other elements included at highlight reel of Henry’s first year (made via iMovie), party buckets with America themed fun (courtesy of Oriental Trading and the One Spot at Target), ring toss, bean bag toss, centerpieces (Party City and Oriental Trading), and of course proper themed utensils, plates, napkins, serving platters, and serving spoons (Party City, Sam’s Club and Oriental Trading). It took a lot of time, it was completely therapeutic, probably expensive (budget is not in my vocabulary) and I had fun. The end result made me smile. While I know he’ll never remember his first birthday party, I’ll always remember the fun I had planning, putting it together and making the memories.